A few days after Verizon launched its first-generation voice over LTE (VoLTE) system in the U.S., dubbed Advanced Calling 1.0, it was confirmed on Friday that Apple's latest iPhone 6 and 6 Plus models support the carrier's suite of services, including HD voice and video calling. As noted on the U.S. carrier's website, Verizon's Advanced Calling 1.0 services suite went live nationwide on Sept. 15, bringing high-definition voice calling, simultaneous voice and data over LTE and video calling to compatible smartphones. First spotted by MacRumors and independently verified by AppleInsider, Apple's iPhone 6 and iPhone 6 Plus support the new VoLTE network. iPhone 6 owners take advantage of Advanced Calling 1.0 HD Voice and video calling by adding the free services to their account via Verizon's website. Once activated, the telecom informs users to navigate to the iPhone's Settings menu and select "Cellular > Enable LTE > Voice & Data" to turn on the feature. With the added functionality, Verizon follows in the footsteps of T-Mobile and becomes the latest major U.S. telecom to offer advanced VoLTE services to iPhone customers. 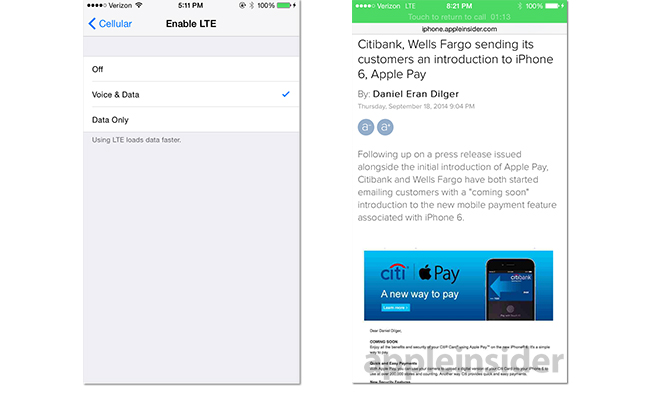 In addition to VoLTE, the iPhone 6 and 6 Plus support Wi-Fi calling, a new iOS 8 feature that lets users place voice calls over Wi-Fi data networks. T-Mobile announced support for Wi-Fi calling in June, while AT&T promised its network will be compatible come 2015.